Pre-owned Rolls-Royce Wraith for sale in Dubai. White 2016 model, available at Al Bakheet Motors. This car has automatic transmission, 12 cylinders, 21″ wheels and burgundy interior. 3,500 km, GCC specs. 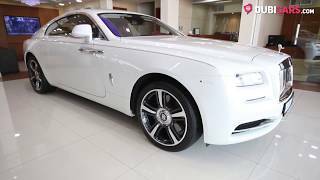 Be sure to check out our video of this Rolls-Royce Wraith above!